YYJ Atmosphere and SPYY Skyy Chaser are here! YoYoExpert September 5, 2009 Comments Off on YYJ Atmosphere and SPYY Skyy Chaser are here! YoYoExpert June 6, 2009 Comments Off on Celebrate National Yo-Yo Day! YoYoExpert celebrates National Yo-Yo Day! June 6th is National Yo-Yo Day and is a time to celebrate this amazing sport! YoYoExpert is excited to celebrate its first National yo-yo day with a special offer. YoYoExpert May 24, 2009 Comments Off on YoYoExpert: Hectic Unleashed! YoYoFactory unleashes Hectic YoYoFactory releases their second in the line fundaMETAL affordable but high performance yo-yos. Hectic is here! The Hectic is a strong player with reminiscent features that have made the G5 popular. 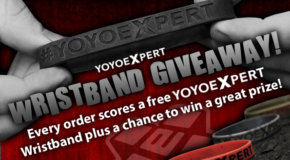 YoYoExpert Newsletter: Dv888 Moving Fast! YoYoExpert May 20, 2009 Comments Off on YoYoExpert Newsletter: Dv888 Moving Fast!